fill: The fill property specifies the background of the scene. The default fill of the Scene is Color.WHITE. The setFill(Paint value) method sets the value. The Paint is the base class for a color or gradients used to fill shapes and backgrounds when rendering the scene graph. root: The root property specifies the application’s root Node for the scene graph. The root can be a Group or a resizable node (layout Region or Control). The setRoot(Parent value) method sets the root value. Note that a null cannot be specified for the root property. size: The scene’s size may be initialized by the application during construction. If no size is specified, the scene will automatically compute its initial size based on the preferred size of its content. depthBuffer and antiAliasing flags: These are conditional features. The root, fill, size properties can also be specified while constructing the scene as constructor arguments. An application may also specify depth buffer support or scene anti-aliasing support at the creation of a scene. 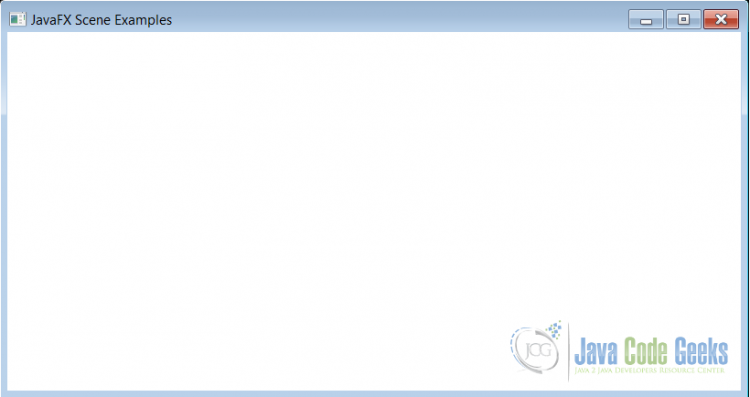 Note that the scene objects must be constructed and modified on the JavaFX Application thread. The scene also defines a number of functions to be called when an event occurs on this scene. The following are some of the events: MouseEvent, DragEvent, KeyEvent, Rotate, ScrollEvent etc… Some related functions are: onMouseClicked, onKeyTyped, onMouseDragged, onRotate, onScroll, etc.. For example, a KeyEvent indicates that a keystroke occurred in a Node. The scene’s setOnKeyTyped(EventHandler value) method sets the value of the property onKeyTyped. The examples in this article show the usage of some properties including, fill, root, size and an event function. This example shows the basic scene without any properties set. The default fill and size properties are set by the JavaFX system. The default fill of the scene Color.WHITE is seen here. The Group is specified as the root Node of the scene graph. From the above code, note that the scene’s constructor specifies the size and the root properties. The root property type is a HBox layout. The setOnMouseClicked() property is set with an event handler class MouseClickListener. The listener class implements EventHandler<MouseEvent> interface. 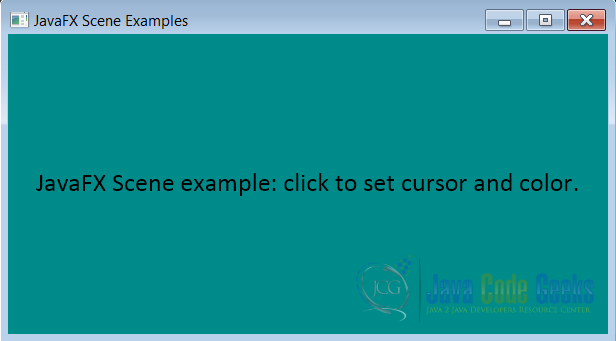 In the GUI, when a mouse-click occurs in the scene area the scene’s background color (fill property) and the cursor’s shape are changed (Cursor defines the mouse cursor for this scene).